How many people are using glycopyrrolate for pediatric sedation? There are many reports in the literature of increased perioperative adverse respiratory events associated with nasal congestion and upper respiratory events. It has been suggested that glycopyrrolate may reduce the incidence of these adverse events through anticholinergic mechanisms that reduce secretions. However, a recent study failed to show a reduction in adverse perioperative events in children with upper respiratory infections undergoing general anesthesia. Ketamine is common agent used for procedural sedation in the emergency department setting. In addition to its sedative properties, ketamine is a potent sialogogue. Historically, standard practice was to administer an anticholinergic, such as gylcopyrrolate, prior to ketamine administration to prevent adverse respiratory events. Published observational studies offer conflicting results as to the effectiveness of this regimen. However, a recently published meta-analysis, failed to show any benefit and suggested that patients who received glycopyrrolate may have an increased incidence of adverse respiratory events. Despite these conflicting studies, it is still common practice in many centers to administer glycopyrrolate to children with increased secretions who will have deep procedural sedation with propofol. There are many reasons to believe glycopyrrolate might be beneficial in this patient population. As opposed to the study looking at perioperative events, many of these patients are receiving deep sedation with propofol for non-invasive procedures (like MRI). These patients are generally lying supine for long periods of time (45 minutes or longer). Since secretions are likely to pool in the posterior pharynx in the supine position, it reasons that decreasing secretions may be helpful. Further, since most patients that receive propofol for deep sedation do so without an ETT or LMA, their airway is not protected from these secretions which may result in an increased incidence of adverse respiratory events. The lack of benefit suggested by the observational studies with ketamine is difficult to extrapolate to the patient population that receives deep sedation with propofol. The studies with ketamine are generally for brief dissociative sedation for painful ER procedures. Conversely, deep sedation with propofol for MRI is a much longer procedure, which for the reasons above may represent different risks associated with secretions. Interestingly, a recent abstract presented at the SPS Annual Conference showed that patients receiving brief deep sedation with propofol +/- fentanyl had an association between pre-procedure anxiety and adverse respiratory events. It could be reasoned that many of these patients with anxiety are also crying and have increased nasopharyngeal secretions. Thus an agent that helps dry the mucous membranes may be helpful in this setting. Tait AR, et. al. G;ycopyrrolate does not reduce the incidence of perioperative adverse events in children with upper respiratory infections. Anesth Analg. 2007;104: 265-70. Green SM, et.al. Anticholinergics and ketamine sedation in children: A secondary analysis of atropine versus glycopyrrolate. Acad Emerg Med. 2010; 17(2): 157-62. This entry was posted in Propofol, Sedation Practice on August 13, 2010 by DrReynolds. In order to answer the poll question, I would like to know what procedure is being done. 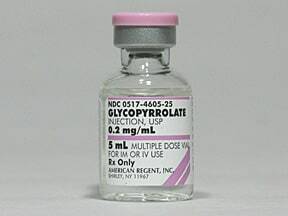 For procedures such as MRI where I do not have ready access to the oropharyngeal airway ,I tend to use glycopyrrolate. For a picc line insertion, I do not routinly use glycopyrolate because I have ready access to suction the oropharynx if necessary. I do about 600 MRI sedations/yr. I have NOT used Glycop. majority of time increasd secretions occur at induction and I trea it withi suctioning, those pts. with lower resp. tract infections, (wheezing, rales–) I defer sedation. My concern reg. GP. is that it will make secretions thicker and potentially could cause atelectasis.